We’re pretty tired of winter & the dull weather here at the Granary and we couldn’t be happier to be receiving a brand new spring menu (we hope the weather will follow suit!). Our chefs have spent plenty of time sourcing fresh ingredients and sampling new dishes. You can expect Haggis Sticks, Sea Bream & our delicious Cajun Chicken Burger! We’ve added a variety of side dishes for you to choose from too which includes Hummus & Crudities and Rocket & Parmesan Salad. We’ve kept some of our old favourites as well as adding a few new flavours. Last week, the whole team got together to try out the new items to ensure we’re all up to speed. 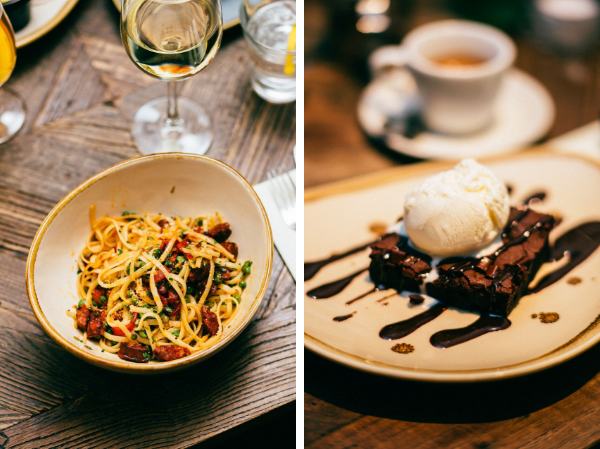 We feel that it’s important for our staff to be knowledgeable about the menu so that we can recommend our favourites and offer some great pairings! Next up, we sampled some of the main courses. Here we enjoyed our new Cajun Chicken Burger, a Fillet of Sea Bream and Linguine with Chorizo, Peas & Parmesan. Our resident Italian, Davide was dubious about the Chorizo & Linguine dish but did admit that the chefs pulled it off! Finally, the best part.. Dessert! Our favourite new dessert has to be the Dark Chocolate Brownie. We’ve been missing something chocolatey of the menu & we’re delighted with the new addition. We hope that you can come along and sample some dishes soon. Keep your eyes peeled for our new drinks menu which will be launching at the beginning of May. Just in time for summer.